A tasting room located in Geyserville’s historic 130+ year old BANK! Wine bottles are stored in the bank vault. Tasting fee is $15 and waived with purchase. and a couple of dessert wines $28! Loads of eclectic stories make up this quirky winery. Owner Charlie was once an entertainment lawyer, film producer and at one point head of MGM. He bought his first vineyard in Sonoma County back in 1977. As a winemaker he liked to experiment and invent his own wine creations. FroZin is a dessert wine Charlie invented. A unique take on ice wine. Meeker is known for colorful handprints. Inside the tasting room handprints are everywhere. One particular bottle of Merlot gets a special winemaker handprint on the front. The story goes, that in the early 90’s, they were growing Merlot to blend with Cabernet. They ended up with excess Merlot and decided to bottle about 50-60 cases. 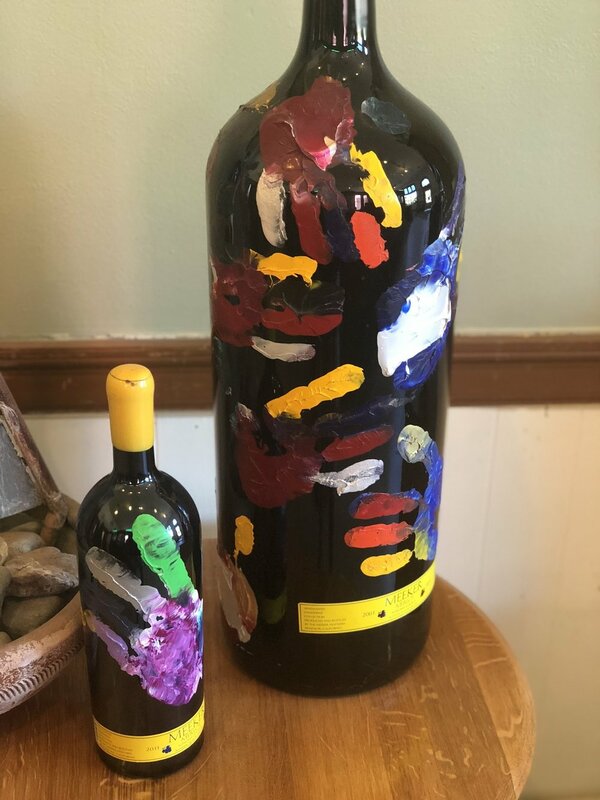 Not quite sure if people would be receptive to Merlot, they put the winemaker’s handprint on the bottle to make it stand out. Customers went CRAZY for Meeker Merlot. Stamping a hand on every bottle is time consuming, but now a Meeker tradition. Lucas Meeker is head winemaker now, and it's his handprint you see. Mention Meeker to a local. See their face light up. The Meeker TEEPEE has quite a reputation! When the winery was out on Dry Creek, there was no tasting room on property. A 40ft tall authentic Sioux teepee was used to host visitors. The teepee was so popular that club members became known as the Meeker Tribe. Wine tasting in Geyserville is a must. Zialena, DeLorimier, Mercury, Pech Merle, Locals Tasting Room and MEEKER! Geyserville also has fabulous restaurants for lunch and dinner. Catellis is my personal fav. Get the burrata! I recommend popping into Meeker. You might get lucky; Charlie may be there to share some stories. Grab a bottle of the Merlot and have Charlie sign your bottle. Snap some pics of you in the wine bank vault.